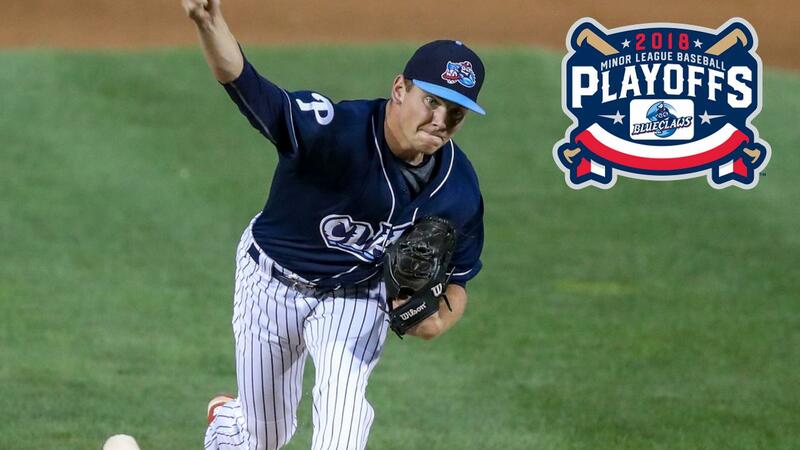 A no-hitter sends te BlueClaws to the Finals! LAKEWOOD, NJ - Spencer Howard threw a nine-inning no-hitter to lead the BlueClaws into the South Atlantic League Championship Series with a 1-0 win over Kannapolis on Friday night at FirstEnergy Park! Howard needed just 103 pitches to navigate 30 Intimidators hitters. He threw the seventh no-hitter in BlueClaws history and the third nine-inning no-hitter by a single pitcher (Gavin Floyd in 2002 and Nick Fanti last year). Lakewood moves into the SAL Championship Series which starts on Monday at Lexington. Games one and two are in Kentucky and the last three are at FirstEnergy Park beginning on Thursday night. Simon Muzziotti broke the scoreless tie in the bottom of the sixth inning with a two-out single to left-enter that scored Jose Antequera. Kannapolis starter Parker Rigler gave up just the one run over 5.2 innings of work. Neither team scored early though Kannapolis loaded the bases in the third inning. Howard escaped the jam when Steele Walker lined out to first to end the inning. Kannapolis got a runner on first base in the sixth on a hit batsman, but the right-hander set aside 18 of the last 19 batters he faced. Howard, a 2nd round pick last year from Cal-Poly San Luis Obispo, led the league with 147 strikeouts this year. The BlueClaws threw a Minor League Baseball-best 23 shutouts during the regular season and this was their first of the post-season. The BlueClaws have now advanced to the SAL Championship Series in all five times they've made the post-season. They are 20-7 all-time in the playoffs and have won three championships (2006, 2009, and 2010). The BlueClaws no-hitters: Keith Bucktrot (7 innings, 2001), Gavin Floyd (9 innings, loss, 2002), Carlos Carrasco & Andy Barb (2006), Jeb Stefan, Ramon Ovideo, and Chris Burgess (2013), Nick Fanti and Trevor Bettencourt (2017), Nick Fanti (2017), Spencer Howard (2018). The SAL Championship Series opens up on Monday in Lexington and turns to FirstEnergy Park for game three on Thursday.